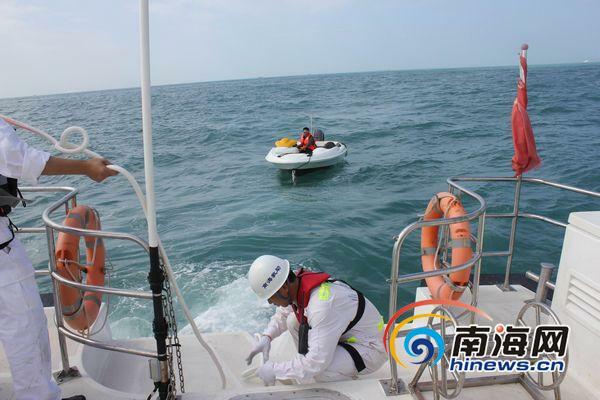 5 tourists who were stranded on the open sea off Dadonghai in Sanya were successfully rescued by the maritime rescue team from the Sanya Base of South China Sea Rescue Department on 14th Jan, reports hinews.cn. The tourists, including one woman, were on a yacht trip in the sea area between Yalong Bay and Dadonghai 12:08 on Saturday. However, the yacht engine ran out of power on their way back to the shore. The Sanya maritime rescue base dispatched a high-speed rescue boat immediately after receiving the help call from one of the tourists. After more than half an hour’s search, the yacht was found on the open sea off Dadonghai at 12:40. At 14:10, the yacht was towed to Yalong Bay as required by the yacht owner. On 11th Jan, 3 tourists were rescued off Sanya Bay after their inflatable boat was taken out to sea by winds and the drift of the tide.